Hannah Kim putts. The senior led the Wildcats to a third place finish at the Stanford Intercollegiate. After a disappointing ninth place finish in its home tournament two weeks ago, Northwestern got back on track with a solid third-place finish at the Stanford Intercollegiate, which concluded Wednesday. It was the Wildcats’ third top-5 finish of the year in the four tournaments the team has competed in this season, and coach Emily Fletcher singled out the home competition as the outlier. 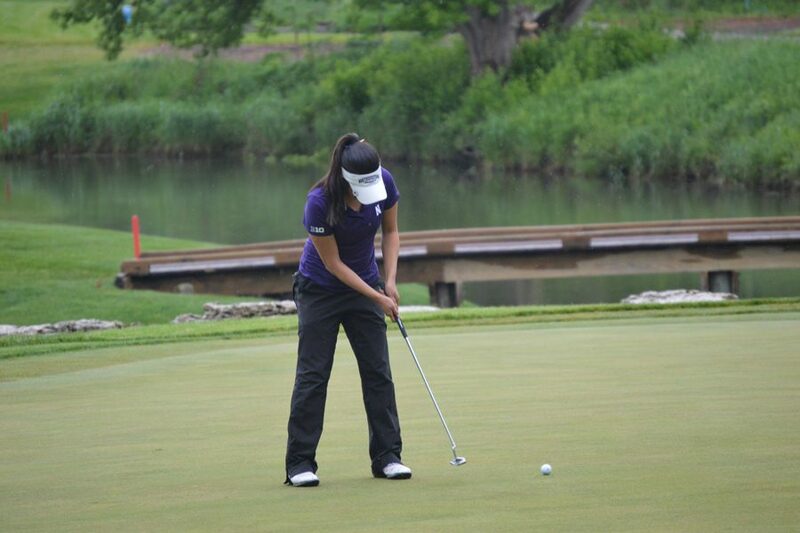 Senior Hannah Kim led the way for NU, finishing third in the individual competition at 5-under-par. Kim came out firing from the start, birdieing the third hole in the first round and never looking back en route to a first round 66, the lowest round shot by any golfer in the entire tournament. Kim came into the final day with a four-shot lead, but her 1-over final round, combined with two 4-under rounds from challengers, dropped her to third. Kim wasn’t the only Cats senior to finish in the top 10, as senior Sarah Cho also turned in an impressive scorecard to finish tied for eighth. Cho had a much more up-and-down tournament, struggling in the first round but pulling things together during the last two days. In round two alone, Cho bogeyed five of the first 10 holes, but birdied four of her final eight to climb back into contention. Sophomore Brooke Riley turned in a top-30 finish of her own, tying for 23rd in her fourth tournament as part of the scoring team. While junior Janet Mao and Riley were able to bounce back from disappointing opening rounds, junior Stephanie Lau continued to struggle and eventually finished tied for 39th in the 74-person field. Overall, Fletcher said she was pleased by the performance, specifically the Cats demonstrating the ability to recover after a difficult start.